Most Americans are interested in living more environmentally friendly lifestyles, yet it’s not always easy to know which practices really are best. New Scientist takes a look at these “Dumb Eco-questions You Were Afraid to Ask”. Hope this helps clear up some doubts or misconceptions. 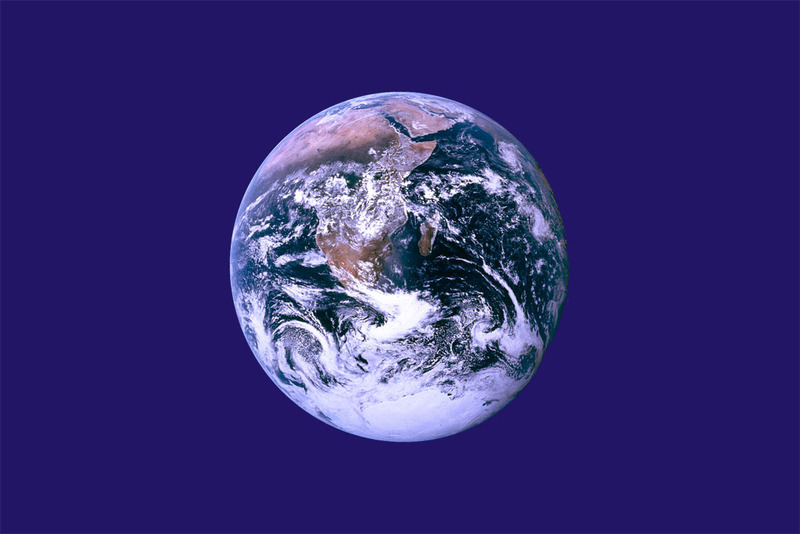 Commonly used Earth Day flag. Source: Wikipedia. April 22 is celebrated as Earth Day in the United States. (In the rest of the world, the March equinox is chosen.) Please use this day to reflect on our planet, our relationship with it, and how our species can exist in harmony with other lifeforms. Help to ensure our children and their children will be able to enjoy our home. An article in last month’s Scientific American, “Fishing Blues” highlights the problems that fishing poses for our marine life. As Earth’s population swells in both number and appetite, our fishing takes its toll through various harms, from overfishing to habitat destruction. And in addition to the inherent loss of losing biodiversity, this will have major impacts on humans — whether from simple shortages to far-reaching effects of damaged ecosystems. Governmental regulations are important, but the most powerful force is that of the consumer. By choosing what to buy and what to avoid, consumers set the priorities for the industry. Clearly, eating sustainable vegetarian food in lieu of seafood or other animals is preferable, when possible. But for those times when one does wish to eat seafood, the Scientific American article points out a useful resource: Seafood Watch (www.seafoodwatch.org, Wikipedia), a program run by the Monterey Bay Aquarium. You can browse through different seafood or search for the one you want. For different areas of the U.S., they have regional guides categorizing common seafood into best choices, ones to select with caution, and ones to avoid. PDF pocket guides are available as well. (You can also access a streamlined mobile version at http://mobile.seafoodwatch.org/. )The tricky aspect, though, is that the same fish can be sometimes be a good or bad choice, depending on where or how it was caught. For instance, U.S. mahi mahi is a good choice, but not necessarily from elsewhere in the world (due to U.S. policies regulating its fishing). This means that you will have to look at labels at markets or ask your server at restaurants to determine if a certain menu item is a responsible item or not. If your server doesn’t know, ask him or her to ask the chef, and if the origin still can’t be reliably determined, select something else. If people keep asking questions, perhaps next time they’ll make sure they know where their seafood comes from. Seafood Watch also has a lot more information, including highlighting which fishing practices are harmful and why, and other actions you can take. Google changes its background color to black in observation of Earth Hour 2008. Today is Earth Hour! If that time hasn’t already passed for you, please remember to turn off your lights from 8–9 p.m. today. And even if it has passed, please remember that, ideally, this should be part of an overall energy-conserving lifestyle. Plan for regular periods of very low energy use, and learn how much you can do even with turning some things off. And in case you missed it, Google has redesigned their home page for today. They’ve changed their color scheme to use a dark background. In my memory, this is unprecedented. I have never seen them take up an initiative like this, and while I have seen them change their logo on numerous occasions, I do not recall them ever changing their whole color scheme like this. I am really impressed that they did this—they have the potential to reach so many people and what a great way to really call attention to Earth Hour. Of course, they have a long history of supporting environmental projects. They include a prominent link explaining their support of Earth Hour so anyone will be able to read about why they’re doing this.